This recipe is inspired by a salad by Bryce Gilmore, owner of of Austin’s own Barely Swine. The abundant savory roasted vegetables along with a butter-based dressing make it a very satisfying entree salad. 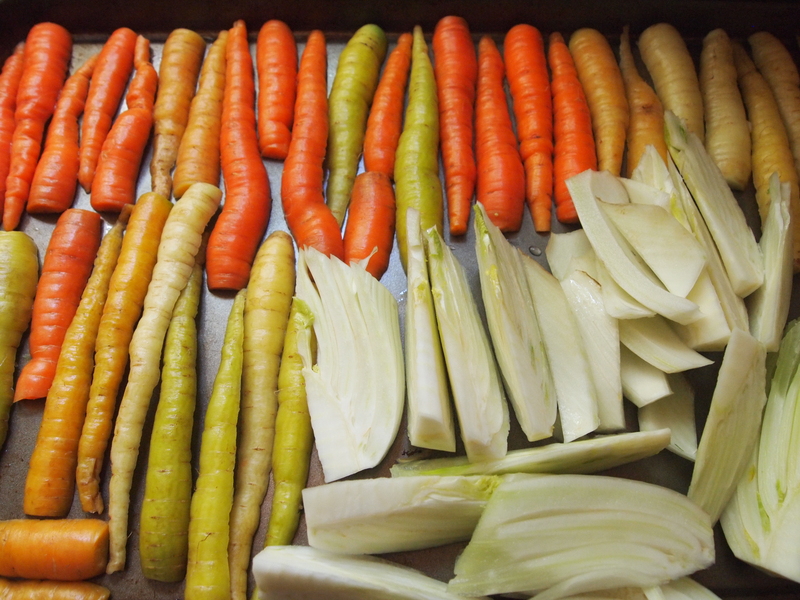 Spray a large cookie sheet with olive oil and arrange the carrots and fennel on the sheet for roasting. Spray the vegetables liberally with olive oil and sprinkle with minced garlic, paprika, and salt. Place the vegetables in the oven to roast at 350 degrees until vegetables are tender and fragrant, about 20 minutes. While the vegetables are cooking prepare the dressing. Melt butter in a small skillet and cook over medium heat until slightly brown with a nutty fragrance. Transfer the browned butter to a blender and combine with balsamic vinegar and one tablespoon of sunflower and pumpkin seeds. Season with salt to taste and set aside. 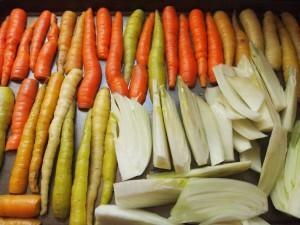 When the vegetables are finished roasting, remove from the oven and allow to cool for five to ten minutes. Assemble the salad by arranging a serving of vegetables over 1/2 to 1 cup of arugula, drizzle with dressing, and top with a sprinkle of the remaining sunflower and pumpkin seeds.